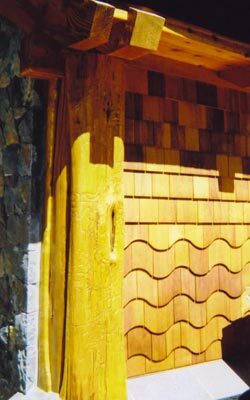 Geronimo Pole Co. offers an auspicious collection of rustic log trim and siding packages. Typical log trim is hand peeled and sold from 3 inch up to 8 inch widths. The thickness profile can vary from 1.5 inches to 4 inches approximating what would appear from a side view to be either a 1/4 log up to a half a log. Auspicious character pieces can be used to flank entryways and are sculpted by knot placement, burls or catfaces. Another option is 1/4 thick log jacket boards, which have quality intact bark. We also sell wider jacket slab boards in the 8 inch wide size up to 20 inch wide. These can be trimmed to have flat edges and placed side by side as a thinner form (1.5 to 2.5 inches thick) of log siding. Here one has the option of a drawknifed, hard washed or bark on face. Besides their obvious use as log siding and trim they look exceptionally well as interior custom siding and Wayne's coating. We also sell slab siding, which consists of a thinner cut log slab typically cut in 4 quarter, 5 quarter, and 6 quarter (1 inch to 1.5 inch) thickness. Various lengths and species are available. Volume order discounts, priced accordingly. Custom Siding and Trim pdf document.